Setting aside for a moment the battalions of soldiers that populate our media history, the gun wielding heroes (and occasional heroines) who weave a treacherous path through enemy infested territory, let us look at a specialized task of condensed terror and men burdened with the risk. Hurt Locker, the latest work of Director Kathryn Bigelow, is part classic war film and part inventive thriller. 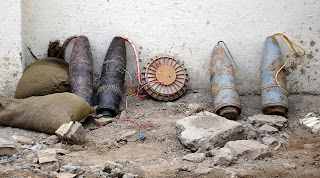 Screenwriter and journalist Mark Boal penned the script, imbuing it with his experiences embedded with an American bomb unit tasked to disarm Improvised Explosive Devices (IEDs), frequent killers in Iraq. 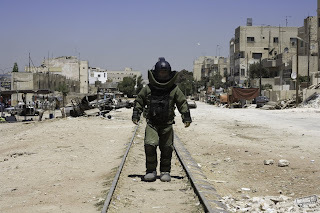 Hurt Locker was a quiet yet suspenseful success, one I thoroughly enjoyed viewing. This isn't a film review, so my hearty recommendation must suffice. Rather, one scene -- enveloped by context of course-- piqued my interest in particular. Allow me some non-spoiler background. Specialist Owen Eldridge (Brian Geraghty) provides support for a three member team led by Staff Seargent William James (Jeremy Renner), the man who dons the bomb suit with frightening ease, regularly putting all of their lives at risk. With slightly over a month remaining in his tour of duty, Eldridge is buckling under the strain and contemplating inevitable death. 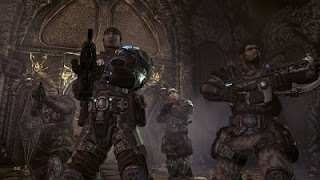 In the scene in question, a Colonel reassures Eldridge, interrupting his play session of Gears of War 2. It comes as no surprise that soldiers unwind with videogames, relieving combat stress or the invisible monotony of war. My reaction was not consternation that Bigelow was equating violent videogames to actual violence, which may or may not have been her intent, but interest in two fictional characters. Eldridge has about as much in common with Marcus Fenix and I do, yet both make up consumable warfare. Marcus is a maverick, taking mankind's fight for survival to the enemy, frequently killing grotesque monsters face-to-face with never a civilian to muddle the mission. Marcus has no reason to hesitate. Eldridge on the other hand, is scared. His enemies are faceless, there is no queen to eradicate, only another bomb between him and his last day of duty. Each mission is less about his capabilities and more about fate. Eldridge has no power over if or when an IED will go off, and one mistake could skew luck against him. For Marcus, war is hell but at least it's simple. During an interview with David Chen of Slashfilm, Director Kathryn Bigelow stated Hurt Locker is "looking at the price of heroism and the cost of that kind of bravado and that cost of that skill set." As she sees it, Eldridge and his team members are heroes carrying a great burden. Of course Eldridge plays Gears. Of course I do too. So it is that Gears of War and its war game compatriots join the ranks of simplified combat films (in contrast to Hurt Locker), resting comfortably with John Wayne's The Green Berets and Pearl Harbor. This is not to critique the quality or content of these works; surely each holds a shred of reality. Rather, our consumption of palatable warfare exists across mediums. The creation of violence aside, do war games help some people rationalize and make sense of combat? Perhaps not many, but yes, absolutely. Of course there are those who want war to be simple, who want easy answers to explain away countless lives lost. Who would not seize an opportunity to cull the madness of warfare? Even films that reveal some of the complexities of war, including Hurt Locker, simplify other aspects for the benefit of comprehension. There are times where simplicity is required, when we calm our consciousness to tell other stories too easily lost in the overwhelming ugliness of humanity at war. Some of these are painful, others beautiful. This partly explains our fascination with World War II in film and video games. It is an ostensibly understandable and just war that was, in reality, anything but simple. There is a danger in succumbing to simplicity. There are those who believe in the fantasy of a palatable war. I believe this is less the result of media than self-imposed blinders, but I don't take this for granted. For soldiers like Eldridge, there is only the hope of temporary relief, un-dulled by hopeful catch phrases. In response to the army's "Be All You Can Be" slogan, Eldridge asks "what if all I can be is dead." There are also times when the story of Eldridge, or the real life stories of the individuals he was based on, are what we desire. We willingly give away our agency by partaking in a non-interactive film, one that does not empower us the way Marcus empowers us. We, on occasion, want to feel powerless. Films like Hurt Locker, which does not explicitly tackle the merits of war in Iraq, can still depict one small shred of the complexities and brutalities of war. I willingly enter Eldridge's world, one without restarts, easy answers, or visible threats.There are moments when games are too easy, the protagonists too effortlessly heroic. There are times when we want to feel trapped under the flaws of humanity for many reasons. If possible, I would like to see games give us this difficult experience. For starters, I would point out a good first step I think relates to this idea of games presenting difficult scenarios, namely the death of the playable character in COD4. I know you guys have talked about this to some extent, but I think this brings home the idea that is posited in the movie: "What if all I can be is dead?" Though I haven't seen the movie yet (sorely like to though), this line underscores so much of what gaming to a large extent is about; the idea that you can be all you can be, whether it be space adventurer, superhuman supersoldier, etc. But in this scene, all you can be is dead. I would agree with you though, that I would in some ways love to be confronted by this intractable virtual reality more often. To experience that moment in COD4, was so jarring in its realism, but also for how well it was done. Great point on CoD4. The death scene in particular contrasts with the traditional empowerment of war games, so definitely spot on.